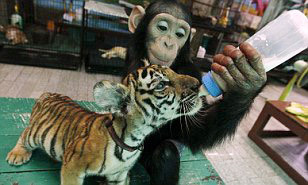 Some adorable images reveal the close bond that has formed between a two-year-old chimpanzee called Do Do and a two-month-old tiger cub called Aorn. Completely at ease in each other’s company, the ape’s motherly instincts take over as she attentively bottle-feeds the baby tiger. Aorn gratefully laps up the milk as Do Do tenderly holds the tiger in her arms. At one point, Do Do puts the bottle in her own mouth - almost mimicking the actions of a human mother checking to see if the milk is suitable for her offspring to consume. For some unexplained reason Do Do is wearing a pair of denim shorts - perhaps to protect her thighs from Aorn’s claws. They were photographed at Samut Prakan Crocodile Farm and Zoo on the outskirts of Bangkok, Thailand. The crocodile farm houses some 80,000 crocodiles. However, the farm doesn’t just contain crocodiles. The Oxford University team said bigger brains did not make people smarter. Humans living at high latitude have bigger eyes and bigger brains to cope with poor light during long winters and cloudy days. 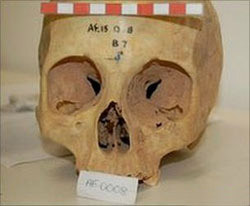 The scientists measured the eye sockets and brain volumes of 55 skulls from 12 populations across the world. Lead author Eiluned Pearce told BBC News: "We found a positive relationship between absolute latitude and both eye socket size and cranial capacity." The team, from the Institute of Cognitive and Evolutionary Anthropology, used skulls dating from the 1800s kept at museums in Oxford and Cambridge. The skulls were from indigenous populations ranging from Scandinavia to Australia, Micronesia and North America. The largest brain cavities came from Scandinavia, while the smallest were from Micronesia. Eiluned Pearce said: "Both the amount of light hitting the Earth’s surface and winter day-lengths get shorter as you go further north or south from the equator. We found that as light levels decrease, humans are getting bigger eye sockets, which suggests that their eyeballs are getting bigger. They are also getting bigger brains, because we found this increase in cranial capacity as well. In the paper, we argue that having bigger brains doesn’t mean that high-latitude humans are necessarily smarter. It’s just they need bigger eyes and brains to be able to see well where they live." Good news for families that would love to have a furry dog or cat but hesitate for fear the kids might become allergic: Fido or Kitty might actually be good for children’s health, scientists say. They found that children who were exposed to animals at a young age had lower rates of nasal allergies as adolescents. "Family pets, in particular dogs...need not be removed to prevent allergies, and in fact may protect against them," Melanie Matheson of the University of Melbourne, lead author of the study said. Looking at survey responses from nearly 8,500 adults from Europe and Australia, Matheson and colleagues focused on those who grew up around house pets or farm animals, and those who had the troublesome runny noses, itchy eyes, and sore throats that plague nasal allergy sufferers. In the new study, published in the Journal of Allergy and Clinical Immunology, more than one in four respondents said they had nasal allergies. In most cases, people said their allergies started when they were adolescents. A number of factors were linked to a higher risk of nasal allergies in the study. Some, like a family history of allergies and the mother smoking while pregnant, are well documented risk factors. 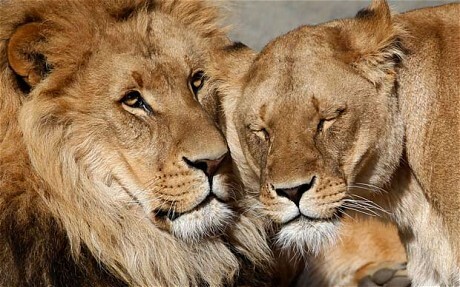 Scientists studied records of nearly 500 lion attacks on Tanzanian villagers between 1988 and 2009. In more than two thirds of cases, the victims were killed and eaten. The vast majority of attacks occurred between dusk and 10pm on nights when the moon was waning and providing relatively little light. Lions hunt most successfully when darkness allows them to surprise their prey, but on bright moonlit nights they might have to go hungry. The period immediately following a full moon provides a lion with a welcome opportunity to catch up on missed meals. "Although we are safest from lion attacks during well-lit nights, the full moon accurately indicates that the risks of lion predation will increase dramatically in the coming days. Thus the full moon is not dangerous in itself but is instead a portent of the darkness to come." said the scientists. 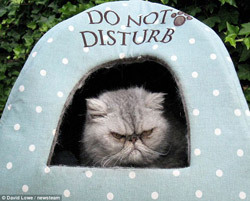 Could this moody moggy be Britain’s grumpiest cat? Scowling at the camera with more than hint of discontentment, the irritable puss Pip is constantly in a grump. 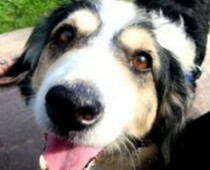 According to his owner, Rose Oughton, Mr Pip does not like noise, bad weather and especially hates football. The Persian Burmese breed’s favourite past-time is ’staring at dogs’ and sitting quietly in his favourite bush in the back garden. But even when he’s at his happiest, you wouldn’t think it to look at the sour-faced feline. The widow, and mother of two, says she was concerned there might be something wrong with Mr Pip, due to his grumpy looks, and even took him to the vets. But the vets said his face is perfectly normal and there’s nothing to worry about. ’The reason he looks so glum is because of the Burmese in him,’ Mrs Oughton said. New Zealand Prime Minister John Key’s son was named the country’s "top planker" Tuesday after a photo appeared online apparently showing him performing the Internet craze as his father looked on. The New Zealand Herald said the grainy picture of Max Key planking on the back of a couch in the prime ministerial residence appeared on the "Planking New Zealand" Facebook page this week, causing a stir among Internet users. 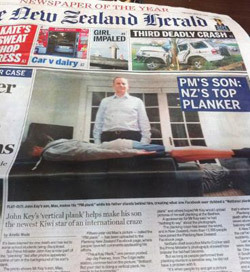 In a front-page headline, it declared the 16-year-old "NZ’s top planker" but noted the prime minister himself had not personally performed the stunt. Planking involves someone lying flat on their stomach with their arms against their bodies in unusual and sometimes dangerous situations, with photos of their exploits posted on social media sites. The fad has been linked with at least one fatality in Australia, when a man was killed in Brisbane in May after plummeting to his death while attempting to "plank" on a seven-storey balcony. 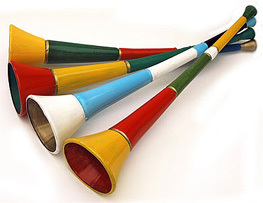 Vuvuzelas - the horns used by football fans celebrating last year’s World Cup - not only cause noise pollution but may also spread diseases, say experts. In crowded venues one person blowing a vuvuzela could infect many others with airborne illness like the flu or TB. Organisers are considering whether to allow them at the 2012 London Olympics. Dr Ruth McNerney, who carried out the latest work at the London School of Hygiene & Tropical Medicine, said a "vuvuzela blowing etiquette" may be needed rather than a ban. "Just as with coughs or sneezes, action should be taken to prevent disease transmission, and people with infections must be advised against blowing their vuvuzelas close to other people," she said. 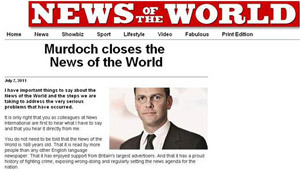 Britons rushed to buy the final copy of the News of the World newspaper Sunday, putting aside for a moment their disgust at the phone-hacking scandal to snap up a little piece of journalistic history. The paper has in recent months been selling just over 2.6 million copies a week but the final copy, whose front page carried the headline "Thank You and Goodbye", sparked a surge in sales. New claims about phone hacking this week sparked national outrage -- but the decision Thursday to axe the publication was a shock and many were keen to buy the final edition as a souvenir. "I think it’s a bit of a shame since it has been around many, many years and it’s part of British culture but they were wrong for what they were doing," Shareen Geral, a 26-year-old make-up artist said. Some shared their mixed feelings about the demise of the 168-year-old paper, but others were simply irritated that Sunday would be a little less entertaining from now on. "I am a bit annoyed because obviously it was an enjoyable paper with the sports supplement on the Sunday," said 31-year-old sales manager Martin. Star, the dog found horribly abused and buried alive in Malta last week, has died. Maltese police found the poor dog buried in a shallow grave. She had been shot 40 times in the head with a pellet gun and her snout was tied to prevent her from barking in pain. Her paws were bound, too. Police discovered her when they heard a whimpering sound coming from under some planks of wood. The fact that Star survived to be rescued was a miracle. The stray dog had been horribly abused by someone who still has yet to be apprehended. Her caretakers were so sure that she would make a strong recovery that they began to let Star integrate with her new owners. There was no end to the amount of love given by Star’s new adopted family. For a while it seemed as though this story would have a happy ending. But shortly after going home with her new owners Star began to vomit and had to be operated on again. She died yesterday of acute inflammation of the pancreas. Star brought together Malta’s animal rights activists, who are vowing to continue to seek out her abusers and ensure that some small amount of justice is done in her name, and that no other animal has to suffer as terribly as she did. A young emperor penguin stranded in New Zealand has survived two medical procedures and now has an offer of a lift home. Yet the aquatic bird that many are calling Happy Feet - after the lighthearted 2006 movie - is not out of danger yet. The penguin remained on an intravenous drip Saturday and faces another procedure Monday to remove more sand from its digestive system. If it does pull through, a businessman wants to take it by boat to Antarctica next February. Happy Feet arrived on Peka Peka Beach, about 40 miles （65 kilometers） northwest of Wellington, June 20, 2011, the first time in 44 years that an emperor penguin has been spotted in the wild in New Zealand. Typically, emperors spend their entire lives in and around Antarctica. At first Happy Feet seemed fine, but as the week progressed, the bird became more lethargic. It ate a lot of sand, apparently mistaking it for snow, which emperor penguins eat in Antarctica to hydrate themselves during the frozen winters. One out of every seven new mothers has post-natal depression - but, according to the Fatherhood Institute, one out of every 10 fathers are depressed both before and after their baby is born. The peak time for fathers’depression is thought to be between three and six months after the birth. Like women, they can struggle with the huge life changes a baby brings, says Fatherhood Institute research head Adrienne Burgess. "Hormones, lack of sleep, increased responsibility and general life stresses can apply to men just as much to women. And if their partner is depressed, then men are more likely to be too." she said. Men and women who have pre-existing mental health problems are more at risk of developing depression after the birth of a child. But a father’s depression can begin during pregnancy, when relationships are already changing. Fathers can feel left out while their partner is the focus of increased attention. Association for Post-natal Illness counsellor Liz Wise says："Women can feel they do things best, like changing a nappy or feeding. They can be quick to criticise their partners and take over. They don’t think about how it could undermine a man’s confidence."